This morning members of the Edmund Ruffin Fire Eaters attended the private ceremony held by the VA Flaggers where they raised a 20′ x 30′ battle flag on an 80′ pole on private land on Interstate I-81/I-64 just north/east of Lexington, Virginia. 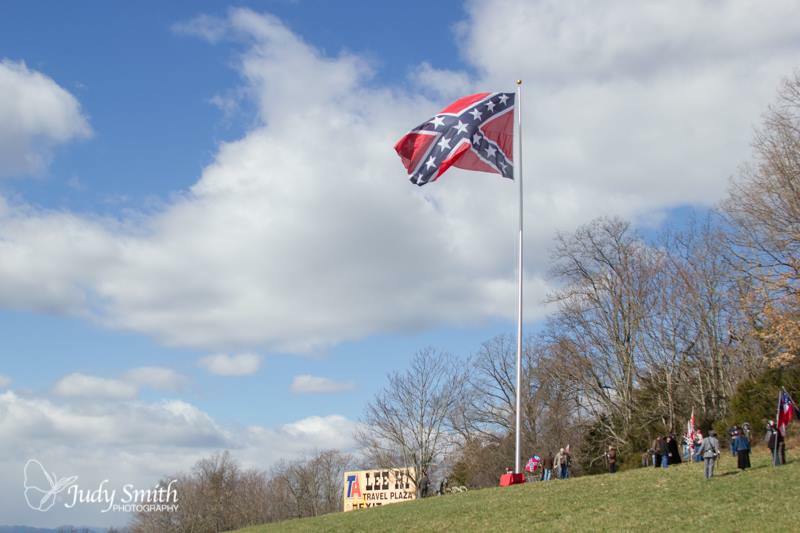 The Lexington I-81 Memorial Battle Flag is the fourth roadside memorial battle flag erected in Virginia by the Va Flaggers since September of 2013, and part of an ongoing project to promote Confederate history and heritage, and honor Confederate Veterans in the Commonwealth. This project, and numerous other heritage defense efforts, is made possible through the generosity of supporters from across America and beyond. 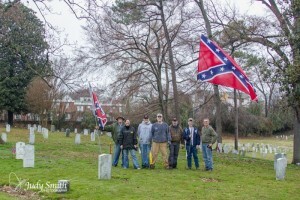 The Edmund Ruffin Fire Eaters SCV Camp #3000 organized a clean up this morning in the Confederate section. Thanks to the VA Flaggers’ Susan Hathaway and Judy Smith, Robert E. Lee Camp #1589 member Roy Jordon, and Fire Eaters Joe Howard, Jim Tingle, Patrick Seay, Jimmy Creech and Fred Merridew for a very productive morning’s work at Hollywood Cemetery on the 14th. We picked up sticks and trash, trimmed trees and cut back brush in the Confederate Section and it certainly looked better. It was a gloomy morning, but we persevered. Douglas Crenshaw, author of “Fort Harrision and the Battle of Chaffin’s Farm” was our speaker this evening. 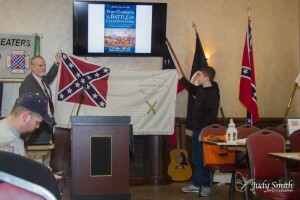 He discussed the significance of Fort Harrison and the Battle of Chaffin’s Farm.